Ever wonder what a vaporizer is? How about kief? 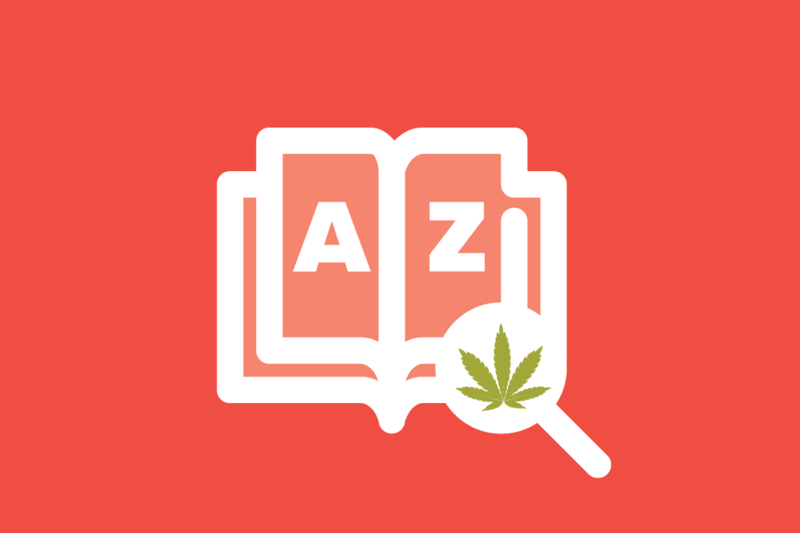 We’ve compiled a glossary of terms, courtesy of our friends at Leafly and the Providence Journal, to help you better understand what all the buzz is about. As recreational marijuana legalization efforts continue in Vermont, we’ll be updating this page with new terms. Butane hash oil is a potent concentrate of cannabinoids made by dissolving marijuana in its plant form in a solvent, usually butane. The resulting product has very high THC levels and is a thick, sticky oil. BHO is also referred to as honey oil, “dabs” or “dabbing,” earwax, or shatter, depending on the manufacturing method. Cannabis wrapped in a tobacco leaf cigar or cigarillo paper. Blunts often burn longer than joints and are usually found in larger social gatherings. A handheld pipe, usually made of glass, with a water reservoir at the bottom that cools and diffuses the smoke before it is inhaled. Marijuana flowers. These fluffy parts of the plant are harvested, dried, and used for recreational or medicinal purposes, as they contain the highest concentrations of active cannabinoids — often 10 percent to 25 percent THC. This is the attendant working behind the counter at your local dispensary or retail cannabis shop who may be able to answer your questions on strains and cannabis products, as well as make suggestions based on your needs. The chemical compounds unique to cannabis that act upon the human body’s cannabinoid receptors have numerous medical benefits. The best-known and most abundant cannabinoid is tetrahydrocannabinol, aka THC, which produces the plant’s psychoactive effects. CBD is another of more than 85 known cannabinoids. This plant genus produces three species of flowering plants: Cannabis sativa, Cannabis indica and Cannabis ruderalis. Cannabis sativa and Cannabis indica are used to produce both recreational and medical marijuana. Cannabis ruderalis is rarely farmed, due to its lower THC content and small stature. Cannabis is native to Asia but grows almost anywhere and has long been cultivated both for the production of hemp and to be used as a drug. CBD is the abbreviation for cannabidiol, one of the roughly 85 cannabinoids found in cannabis. Recently, CBD has been credited with treating pain, complications from multiple sclerosis, inflammation, epilepsy and anxiety — without the psychoactive effects associated with THC. Concentrates are a potent consolidation of cannabinoids that are made by dissolving marijuana in its plant form into a solvent. The resulting product has very high THC levels — generally more than flowers or hashish. This umbrella term includes products such as oil, hash, shatter and wax, made through extraction processes, which can be vaporized or smoked. A community of patients or consumers in a given area who join together to share and receive marijuana. Co-ops usually have specific membership requirements, and the product available is generally exclusive to members. In some states, co-ops exist alongside or in lieu of dispensaries. A clipping from a cannabis plant, which can then be rooted and grown through a cloning process of the mother plant. Short for crossbreeding, this happens when two different plant strains are bred together. For example, Blue Dream is a cross between Blueberry and Haze strains. A slang term used to refer to a dose of cannabis concentrates “dabbed” onto a red-hot surface and inhaled. The act of “dabbing” refers to partaking in dabs. Dispensary is a general term used to refer to any location where a patient or consumer can legitimately and safely access cannabis, whether the business is technically an access point, pickup location, co-op, collective or any other version of a legal cannabis distributor. Marijuana-infused products ranging from cookies and brownies to candies and drinks. It can take up to two hours to feel the effects that will then last for six to 12 hours. Feminized plants come from seeds that have been selectively bred to produce only female plants — the ones that produce cannabinoid-filled flowers. The time it takes for a plant to produce mature flowers, which is usually related to sun exposure. The reproductive organ of the female plants, cannabis flowers are the hairy, sticky, crystal-covered bits that are harvested and dried to be used as medication. When they are allowed to be fertilized by male plants, these flowers will produce cannabis seeds. If not, they will continue to produce the resin that contains their active cannabinoids until they are harvested or begin to die. Derived from cannabis plants, hash or hashish ranges in potency but is generally stronger than straight flowers, since everything but the active part of the plant has been removed. A similar concentrated product can also be produced chemically using a solvent; however, this product is commonly referred to as hash oil or honey oil. A cannabis strain that was taken from its native homeland and propagated in another geographical location. Hemp is a fibrous product derived from the male cannabis plant that can be used in the manufacture of rope, paper, beauty products and a vast array of other products. Hemp has no value as a drug. It is legal in Vermont but is illegal on the federal level. A genetic cross of one or more separate strains of cannabis. Hybrids can happen unintentionally, but they are usually bred specifically to combine desired traits of the original plants. Most marijuana on the market today is some form of hybrid. A system of gardening that uses water instead of soil and gives growers more control over nutrient intake and stability. In terms of marijuana production, plants grown hydroponically are sometimes said to have cleaner, more distinct flavors. A term used to refer to BHO. One of the two main types of marijuana, indicas are advertised as calming and sedating, a muscle relaxant, and best for nighttime use. Compared to their sativa counterparts, the plants are shorter, bushier and have more compact flower structure. Trichomes are the sticky crystals in the marijuana flower that contain the vast majority of the plant’s cannabinoids. So kief — the term for a collected amount of them — is extremely potent. Sometimes mistakenly referred to as “pollen,” it’s the primary ingredient in hashish production. The general term for female cannabis plants or their dried flowers, which contain the high percentage of cannabinoids. This term originally described a strain of marijuana called Southern California’s Ocean Grown Kush. OG Kush quickly grew in fame and reputation and is now used to describe many variations. This cultivation term refers to the general physical characteristics of the plant such as height, color, branching and leaf configuration down to cell structure — any markers that can be used to identify and judge its healthiness. Pistils are part of a female plant’s anatomy. On cannabis, it presents as little hairlike extensions on the flowers that range in color from white to red to darker orange-brown. In the process of fertilization, the pistil acts to collect the male pollen. When plants are left unfertilized, as in the case of marijuana, the pistils can be indicators of plant ripeness. A pre-rolled marijuana cigarette, slangily known as a joint. Many dispensaries have pre-rolls available for purchase. A low-THC cannabis variety used by breeders for its CBD-rich genetics. Unlike Cannabis sativa and indica, which use light cycles to flower, ruderalis is an “autoflowering” variety, meaning it flowers with age. Originating in Russia, ruderalis is a hardy plant that can survive harsh climates. One of the two main types of marijuana. Its strains tend to grow taller than five feet, are lighter in color and take longer to flower. When consumed, sativas tend to produce more cerebral effects as opposed to physical and sedative ones. They’re advertised as energizing, antidepressant and best for daytime use. A marijuana plant with no observable flowers or buds. A strain is a specific variety of a plant species, developed to produce distinct desired traits in the plant. Strain names often reflect the plant’s appearance, its promised buzz or its place of origin. THC is an abbreviation for tetrahydrocannabinol — the best-known and most abundantly available cannabinoid in marijuana plants. THC is also the component in marijuana that is responsible for the psychoactive effects, or the “high.” Also known as delta-9-tetracannabinol, it was first isolated in 1964 and is thought to serve as a natural defense for the plant against pests. Research has shown THC to be an effective medical treatment for a range of conditions, including pain, nausea and lack of appetite. There is no lethal dose of the compound in its natural form, but it can cause anxiety and paranoia. A liquid cannabis extract usually made with alcohol or glycerol that is often dosed with a dropper. Tinctures can be flavored and are usually placed under the tongue, where they are absorbed and take effect quickly. Tinctures can also be mixed into a drink. Lotions, creams and balms infused with marijuana that can be applied externally to treat pain or skin conditions. Trichomes are the resin production glands of the cannabis plant. In Greek, the word means “growth of hair,” and while these sticky little protrusions can make plants appear a little hairy, they are not hairs, nor are they “crystals,” which is how they are often described. THC, CBD and other cannabinoids are all produced in these glands. Leftover leaves of a harvested marijuana plant. THC can be extracted from trim for concentrates. Dried leaves and flowers of the marijuana plant. A device used to consume marijuana. It heats either flowers or marijuana-infused oils to a temperature that produces a cannabinoid-laced vapor to inhale. Vaporizing is healthier than smoking since there is no smoke to ingest, but this method still produces near-instant effects. With new, more compact models on the market, vaporizing — or “vaping” — is growing in popularity.